Nathan's fever hung around, never getting higher than 101.9. Being the good boy we've taught him to be, he was happy to share and Ben got a fever as well. Nice, huh? Michael took them to urgent care on Sunday just as a precaution, while I stayed home and pretty much sterilized the whole house. No symptoms other than the fever and stuffy noses, and since they both had their seasonal flu shot as well as the H1N1 vaccination, it's not likely to be either of those. But having a fever means they got to stay home from school again today. They are bored and cranky, times two, and I'm feeling a bit of cabin fever as I haven't really left the house since last Wednesday. If you know me at all, you know I am NOT a homebody and this pseudo-quarantine is really a tough thing to pull off. Today I tossed them into the car and we hit the drive thru at In N Out for burgers and shakes. Because I'm totally over PB&J, you know? And what better way to get over cabin fever (or to make it worse) than to look at old photos of places we've been? 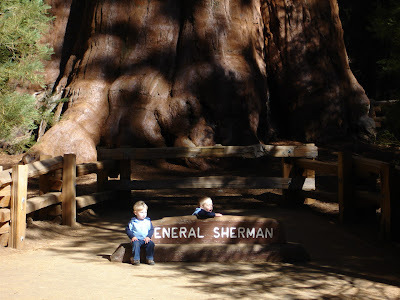 I randomly searched November of 2005 and came up with this photo of Ben and Nathan sitting at the base of General Sherman, the largest tree (by volume) in the world. You can tell that they are impressed, huh? This actually ties in quite nicely with what the boys did to occupy themselves today: they used up a ream of paper and a few rolls of tape to make full-body casts. Thank you to the poor tree who gave up it's life to make the paper that occupied my boys for nearly two hours so I could (ta-da!) get caught up on my writing! I built up a cushion on Saturday and did nothing on Sunday, so today I had over 3,000 words to write, which I did.